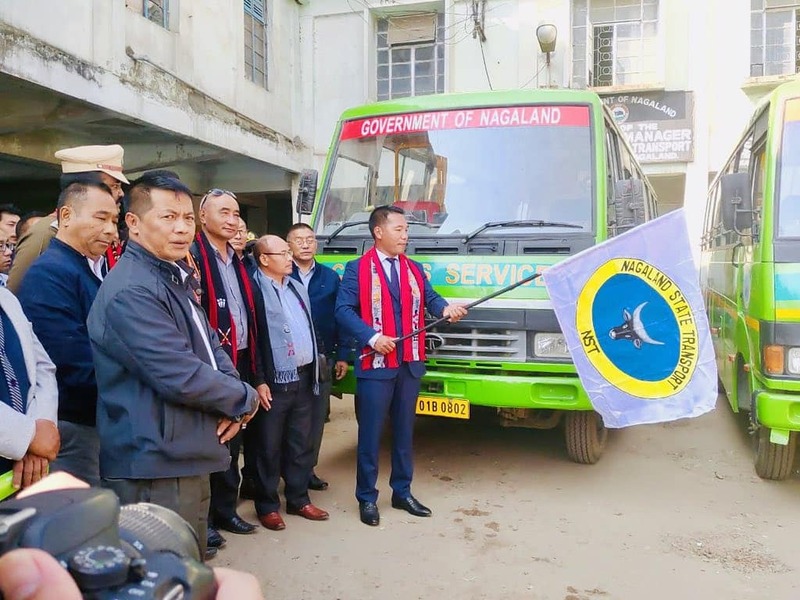 Nagaland minister for transport, civil Aviation, railways and land resources, P Paiwang Konyak on Saturday flagged off three buses from Nagaland State Transport (NST) Station at Mokokchung, which were introduced under Mokokchung City Bus Service. During a brief function, Nagaland State Transport general manager O Elhibemo Yanthan; deputy commissioner of Mokokchung, Rajesh Soundararajan and president of Ao Senden, Chubawati Longchar spoke about the benefits that the bus service will give to the people of Mokokchung. A dedicatory prayer was also offered by Rev Chuba Jamir, Pastor MTBA. The programme was chaired by divisional manager of NST Mokokchung, Vikheto Achumi. Later interacting with media after launching the bus service, the minister was of the opinion that the city bus flagship project in Mokokchung had been implemented as a hilly area trail with very low fares and timely services. The bus service is expected to benefit school and college going students in particular. He also asserted that the departure timings of the buses from respective strategic stops will not be compromised at any cost. The minister also called upon stakeholders in Mokokchung to bear responsibility with the NST in their vision so that this service can be introduced in other district headquarters. Paiwang also said that he had appraised the Mokokchung deputy commissioner to procure a plot of land for the construction of a ‘civil helipad’ in Mokokchung Town, as a beginning to extending helicopter services to all districts and sub-divisions in Nagaland.